Melissa, Bethany, and I were thrilled to get to go to our first college football game of the year this weekend. In fact, for Bethany it was her first college football game ever. And she must be a good luck charm, because SMU won (and we are realizing that doesn’t always happen here). We went with some Perkins students and their spouses and bumped into a GPRS student and his spouse as well. It was a lot of fun, but it was also almost completely different than any previous experience that I have had with college football. 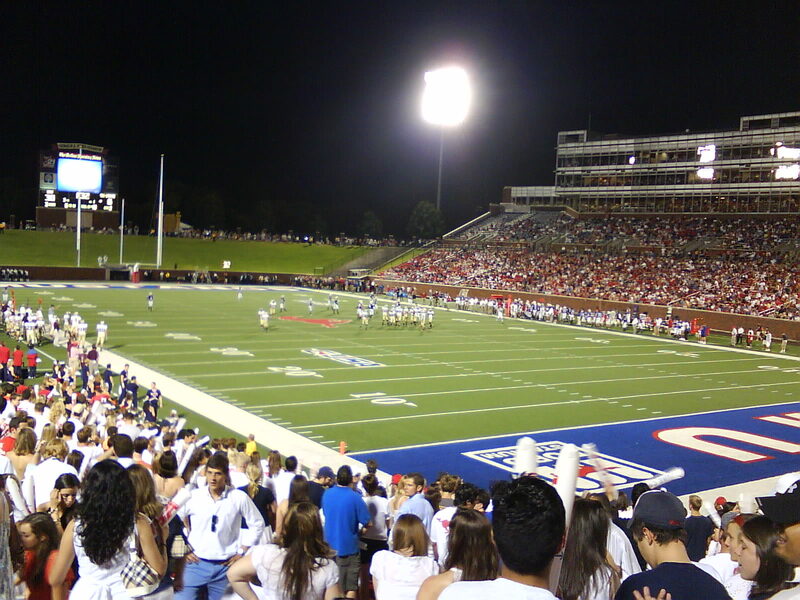 For instance, when we got into the stadium and found where we were going to sit, SMU immediately scored a touchdown. Good news right? Not necessarily. What Melissa and I failed to take into consideration was the fact that Bethany has never heard several thousand people cheer for a touchdown… She started wailing. The only problem was that we could not hear her because of the noise. I looked over at her and saw this look on her face that made me forget about the touchdown… it took some getting used to, and moving to a less crowded part of the stadium, but she did adjust and seemed to really enjoy the game after the first fifteen to thirty minutes or so. Melissa and I graduated from different schools that are in state rivals (OU and OSU) so we are really enjoying having a team that we can both genuinely root for. For those of you who don’t know anything about college football this won’t mean anything… but for those of you who do, SMU hired June Jones, formerly Hawaii’s coach, this offseason. So there is excitement about football here for the first time in quite a while. The slogan on billboards and t-shirts is “June Cometh.” From this Saturday, we look to already have a pretty good offense, but as one of my friends described it, a “pretty porous” defense. So how does the roar of 40,000 compare to 80,000?? We were at the OU-Chattanooga game, but watched Cincinnati from the comforts of the living room. I’m surprised you didn’t consider the possibility the child was wailing because the wrong team scored. Bethany could have been rooting for the other side. And her later calm when you moved may have been simple resignation that her team was going to lose. As a grandfather I’m always amazed when parents don’t see the obvious superiority of their children. Matt – Thank you for your generous estimate of 40,000 fans… and there is no comparison to OU football. But it is still college football! Questing Parson – Bethany would not be a smart child at all if she were rooting for Texas State. It is because of my assumption of her intellectual brilliance that I excluded the possibility of her crying because she was rooting for the wrong team.